Summary : A unique tasting licorice tea that, as the name might suggest, tastes remarkably similar to a piece of black licorice candy. Review : It's been a while since I've had a licorice tasting tea. 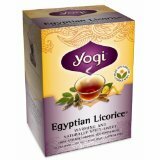 As such, when I came across a package of Yogi Teas Egyptian Licorice on sale at my local supermarket, I couldn't resist picking up a box and giving it a try. The fragrance of the tea right out of the foil wrapper was what it should be - you are greeted with a moderately strong flavor of licorice. While the fragrance won't overpower you or fill up your house, but it definitely is powerful enough to provide hope that the tea will indeed have a strong flavor. Yogi Tea's Egyptian Licorice tea contains quite the list of ingredients: Organic Licorice Root, Organic Cinnamon Bark, Organic Orange Peel, Organic Ginger Root, Cardamon Seed, Natural Tangerine Flavor, Organic Black Pepper, Organic Clove Bud, Natural Cinnamon Bark Oil. Here is how Yogi Teas describes the tea: "The great kings of Egypt treasured licorice root for its natural sweetness, rich flavor and restorative properties. Our Egyptian licorice tea brings you this royal herb in an intriguing blend of complementary spices. This tea is sure to delight with its delicious and satisfying taste, fusing organic licorice with sweet and spicy notes of savory cinnamon and zesty orange peel. Naturally warming, the herbs and spices in Yogi Egyptian licorice have been traditionally used to support the respiratory and digestive systems. Enjoy this uniquely delectable tea any time, day or night." Like other Yogi Teas, their Egypitan Licorice Tea is marketed as a "healthy tea" that, in this case, is meant to be "naturally warming." I have no idea whatsoever if this tea is naturally warming or supports the respiratory and digestive systems. What I do know, however, is that this tea is a very flavorful and enjoyable tea. The mixture of Egyptian Licorice and Cinnamon combines to produce a very unique, strong taste. Thus, if you're looking for a "weak tea" or one that lacks a punch in terms of flavor, you'll likely not enjoy this tea. Similarily, if you despise black licorice or cinnamon, this tea shouldn't be on your shopping list, either. For those who do enjoy licorice, cinnamon and a strong flavor in their tea, then this Egyptian Licorice tea by Yogi Teas just might have your name on it. Recommendation : Yes. If you like the flavor of licorice and cinnamon (in this case, combined) - and also enjoy strong flavors in your tea - the odds are good you'll enjoy this unique tasting tea by Yogi Teas. Brewing Instructions : Pour 1 cup (8 ounces) boiling water over tea bag and let brew for 5-10 minutes. Eight minutes used for this review.